· Who's Who in Who-ville (interactive map) - There are so many interesting characters that call Who-ville home that it’s hard to keep track of them all. This “Who’s Who” pop-up book uses animation to create a virtual storybook that takes us from Who-ville to Mt. Crumpit. · "You're A Mean One, Mr. Grinch" Lyric Video – Tyler, The Creator puts a modern spin on the Seussian Christmas classic. · Yellow is the New Black – Before they all make their big escape from prison in Despicable Me 3, a couple of lucky Minions get a taste of freedom as they break free with the help of one of their fellow human inmates. · Dog Days of Winter – Max braves the harsh winter weather and an uncooperative Who to bring a sick Grinch his favorite hot tea. · Santa's Little Helpers – Fan favorites – the Minions – are back for another adventure! Having been accidently dropped off at the North Pole, our Minion pals make the most of the situation by trying to become elves. · The Making of the Mini-Movies - Mini in size but not in heart, these short films are fan favorites. From the Grinch and Max to the Minions – you’ll explore the themes of each of the mini-movies through the eyes of the filmmakers who made them. · From Green to Screen - It takes a lot to bring grumpy green to your home screen. 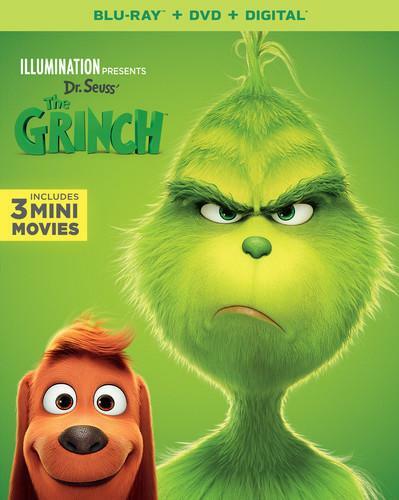 This inside look at the making of Illumination’s Dr. Seuss’s The Grinch features interviews and behind-the-scenes moments with the cast, filmmakers and artists whose hearts have all grown three sizes bringing this classic tale to life. · Illuminating THE GRINCH - Using filmmaker and cast interviews, concept art and progression reels, we take a behind-the-scenes look at how the characters evolved from initial sketches to fully realized characters. · My Earliest GRINCH Memories - The cast and filmmakers of Dr. Seuss’s The Grinch reveal their earliest memories of the grumpy green character and the enduring appeal of this Christmas curmudgeon’s journey to redemption. · Grinchy Gadgets - From his body-size blow dryer to his moving mechanical chair, from his catapult to his dog drone-rig and more… you’ll get to explore the wondrous world of Grinch’s gadgets. · "I Am The Grinch" Lyric Video - A stylized look at Tyler, The Creator’s original song created just for the film. · Songs From His Little Heart - Take a deep dive into the toe tapping beats of Dr. Seuss’s The Grinch. From score to specialty songs, you’ll hear from the film’s A-list musicians on what it took to create the music behind the movie. · X-mas Around the World - Every culture practices Christmas in a slightly different way. We’ll highlight some of the more fun permutations of the holiday around the globe. · Cindy-Lou's Yule Log - Nothing says the holidays quite like an animated fireplace blasting fake heat from your living room television. Just in time for winter, we’ll recreate Cindy-Lou’s living room on Christmas Eve for all to enjoy. · Production Babies - A celebration of the babies born to the filmmakers during the production of Illumination’s Dr. Seuss’s The Grinch. · Any Who Can Draw - Hosted by an Illumination artist and head of story Mark O'Hare, you’ll see step-by-step how to draw some of your favorite characters from this beloved holiday classic; Grinch, Max and Fred!